I finally got around to recording the MIDI music from Touhou 07: Perfect Cherry Blossom playing on my old FM MIDI synth tonight. You can find MP3s of them with the other Touhou FM MIDI recordings, here. I intend to record the Touhou 06: Embodiment of Scarlet Devil MIDIs next. Here’s a coloured version at 4x the original’s size, but it looks worse IMO (due to the colour). 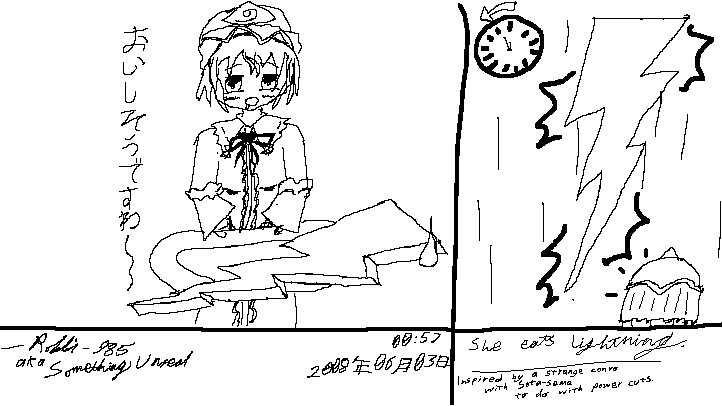 <BoringLengthyDescription> I had a momentary power “cut” (weakening, so my comp didn’t crash), and my friend said it might be a sign from Yuyuko (he’s said this before, it’s a kind of meme we’ve developed – usually followed by “be careful”). Then, a while later, a storm arrived where he lives, and the lightning was messing with his power. 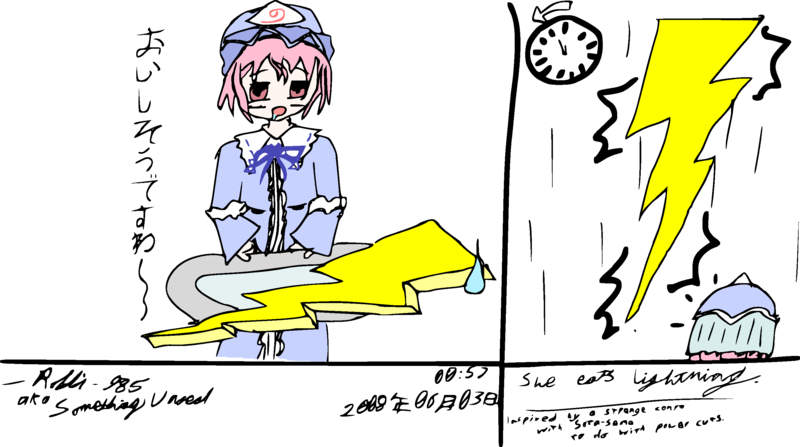 Through a strange chain of messages we decided that Yuyuko was eating the power, and the lightning was just a natural progression from there on. - Her hat (what exactly is going on?? Especially on coloured version). - The reverse-view of her head which looks like a lampshade.